The IPSI Secretariat at the United Nations University Institute for Advanced Studies (UNU-IAS) organized a thematic track session on “Putting sustainability at the heart of landscape and seascape management – Key roles played by subnational and local governments” during the Ninth International Forum for Sustainable Asia and the Pacific (ISAP 2017), on Wednesday, 26 July 2017 in Yokohama, Japan. 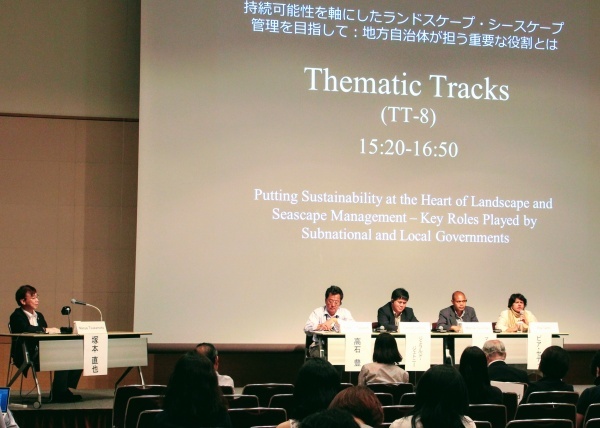 The session focused on subnational policy-related activities toward sustainable management of natural resources in the context of the Satoyama Initiative, a global effort established by UNU and the Ministry of the Environment of Japan to promote the sustainable management of landscapes and seascapes that include significant human production activities, and to preserve and harness their cultural and natural heritage and resources. UNU-IAS ISI serves as secretariat of the International Partnership for the Satoyama Initiative (IPSI), which was created to facilitate implementation of the Satoyama Initiative. Prof. Kazuhiko Takeuchi (IGES; Integrated Research System for Sustainability Science, The University of Tokyo; UNU-IAS) started the session with opening remarks and an explanation of “Sustainable Landscape Management through the Satoyama Initiative”. This was followed by a panel session with speakers from IPSI-member organizations around Asia, and moderated by Mr. Naoya Tsukamoto (UNU-IAS). Mr. Tsukamoto began with a short presentation in which he pointed out that subnational and local governments enjoy the advantages that they are close to the community and enjoy a degree of local independence and potential for strong leadership, but that these can also be disadvantages for landscape and seascape management in some cases. After the presentations, the floor was opened for questions or comments, with audience members raising issues related to the promotion of local products and activities and the role of a state government in making sure that such products are promoted effectively. Panelists closed the session by commenting on the difficulty in finding commonalities in work at the subnational level in that various types of governance districts have very different scales and roles, although it was agreed that it is very important to find such commonalities where possible. IPSI members present acknowledged this importance and renewed their commitment to find commonalities and work together through the partnership.